First, you need to ask your office staff to grant your user permission to run reports (it's off by default). Once you have reporting permissions enabled, you'll see Reports in the left-side navigation. Clicking Reports will take you to the reports list. Choose New time entry report. Adjust the order of a report field by clicking and dragging the green cross up and down. The How should your data be filtered? section is where the magic happens. You're probably going to want some sort of date range on the report. We recommend you use the Started on field, select Greater than or equal to, and fill in the starting date in MM/DD/YYYY format. Next, to include only your own time entries in the report, choose the Name field, select Starts With, and type your first name. Comparison value (in this case, the start date and first name). If you wanted to create a time entry report for more than one employee, you could use the How should your data be grouped? section. 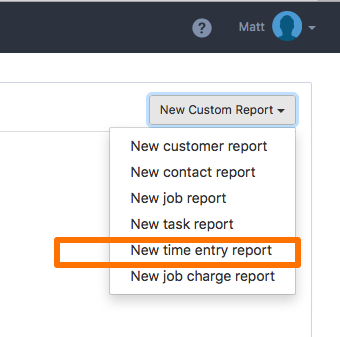 Clicking the dropdown here would allow you to group time entries by employee name. Make sure that the field you want to group by is included in the report fields and filtered properly. Save your report. Your new report will show up in the Custom Reports list.